I pack a suitcase of things I might need for the weekend, like textbooks, homework, my U.S. passport and a couple of changes of clothes. I have done this drive more than 100 times, and I know every landmark along the way. For the past six years, my mother, brother and I have spent many weekends driving down to Mexico to visit my dad, who was deported and now lives in Baja California. After leaving Los Angeles, we always stop at the same rest stop between San Onofre and Oceanside. My 11-year-old brother, Tines, bored, usually starts poking me and acting annoying until he gets tired of it or I get mad. Sometimes, my mom yells at us to stop. When we approach the border at night, we first see the bright city lights of Tijuana contrasting with the small dark towns dotting the American landscape. Finally, after about four and a half hours, we arrive at my father’s house. Separation defines our family routine–the stress, the traffic, the hellos and the goodbyes. It makes me sad that our family can no longer have breakfast together before school, and my father can’t give me a ride every morning or pick me up. My life forever changed one spring night. Zola Cervantes with her father and her brother Tines. I was 10 years old, and going to sleep in my room, when I heard strained whispers in the living room. I was a child, but I could feel the tension. I knew something was not right, but I fell asleep. Later that night, I woke up to police sirens, red and blue flashing lights piercing the night and the quiet of my room. I walked into the living room to see a police officer talking to my mom, who was sitting on the couch crying. My dad wasn’t there, and I didn’t know why. The cops were searching the house. That’s when my childhood ended. Nothing would ever be the same. My dad is 46 years old. He doesn’t look as tall as in my memories. His hair has more gray, and there are more wrinkles around his eyes. Living without us these past six years has also taken its toll on him. Yet as soon as we greet each other, it’s like we were never apart. He always asks about school. I tell him about my classes, my work as a reporter for Boyle Heights Beat and the new songs I’m learning on guitar. My brother talks about soccer, hitting the winning run in his baseball game and learning new rhythms on drums. My dad wants to know about my future and the letters from colleges. We haven’t lived together as a family since that night when a fight broke out in our house. While trying to protect us from a “compadre” — a friend of my aunt’s — my father pulled out a gun that didn’t belong to him. When the police came, my father was arrested and later charged with with assault with a firearm and possession of an unregistered weapon. He had a green card and was married to my mother, an American citizen, but had never applied for citizenship. 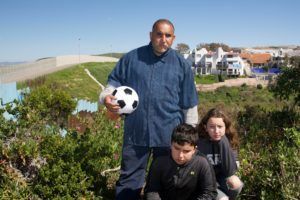 My father didn’t realize until months later that a green card holder could be deported for this offense. My dad spent a few nights in jail and was then released on bail. His court date fell on the day of my fifth grade graduation. At his trial, he was found guilty of brandishing an unloaded firearm, and sentenced to a year in jail. He served part of his sentence and then was sent to an immigration holding center. 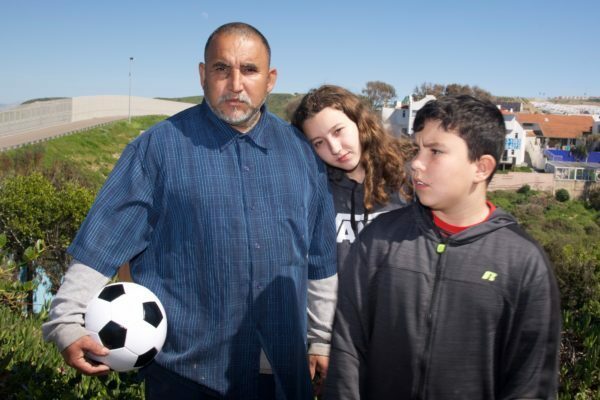 A few months later, he was deported to Tijuana. My father would never get to see me graduate from elementary or middle school. When I graduate from high school this June, he won’t be there either. My dad was one of 400,000 immigrants deported in 2010 by the Obama administration. 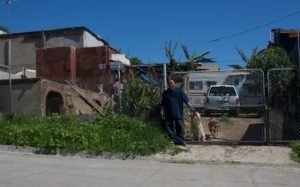 He now lives in Rosarito. He wanted to be close to the border and chose the small beach community because there are jobs and it is not as dangerous or urban as Tijuana. He lives in a half-built one-room house in the residential section of the city, with a small view of the ocean. He is an auto body worker, making about $200 a week, and pays $42 a month for rent. When we visit, my brother and I stay in a motor home parked on the property. Over the years, we have adapted to life with a single parent – and with one less paycheck. My mom works two jobs, as a high school teacher and an art teacher at a community college. Some nights she gets home after 11 p.m. I have had to take on more responsibility in the household and have had to be strong for both my mom and my brother. I babysit my brother while my mother is working and get myself to school and back on the Metro. I help out at the house with chores and somehow find the time for homework and extracurricular activities. My mom’s life changed completely after my father left. “He’s my husband,” she says. “I would talk to him about everyday things, how to face things like the house needs fixing, or problems that would arise with the car. He was like part of my backbone to rely on.” Now she relies on herself – and on me to help. Before my dad was deported, I had always looked up to him as the guardian of the house. Afterward, I would sometimes wake up in the night, thinking I heard the front gate open and someone trying to break in. My brother was only five when my dad left, so he has no concrete memories of life with all of us together. He says he’s used to it and that “it doesn’t make him feel different.” But this is the only life my brother really knows. My family talks about possibly moving to Spain so that they can all be together again, but I will be going to college. So except for vacations, I don’t know if I will ever live with my father again. I can’t ever get those years back, but I hope my brother can live with both parents again. With President Donald Trump’s new and expanded deportation policies, I worry more kids will also have to grow up without a parent, something I don’t wish for any child. All photos courtesy of Cervantes Family. Zola Cervantes is a Senior at Francisco Bravo Medical Magnet School and a youth reporter with Boyle Heights Beat. Find out more about our collaboration with Youth Radio here.